Glorious Purpose, known as Loch in the barn, is a steady, flashy warmblood gelding. This horse is not only easy to handle, but is calm and joy to have around the barn. Loch has successfully competed in the sports of three-day eventing and dressage, and has taught a junior rider the ropes of riding. Loch has a smooth feel when ridden on the flat, with swinging gaits and steady connection. In the jumping, Loch is straightforward, with a consistent rhythm and feel to the fences. He is quiet and calm in all environments and for this reason does not require excess riding or lunging. This horse will go on trail rides by himself or in a group and has the same personality at home as he does at shows and new environments. In his training, he is schooling first and second level dressage movements and jumping courses at the height of 3’. Most recently, he received high point at a rated dressage show when competing at training level and first level with a 71% and 73%. Loch has also consistently scored in the low 30’s and 20’s at eventing shows and competed beginner novice. This horse is a competitor in all disciplines with the ability to teach his partner the beginning stages of any sport, as well as be a fabulous companion for daily riding. He would be suitable for an adult amateur, young rider, or junior looking to learn in the sports of jumping, dressage, and eventing. He makes a great partner: easy-going personality, impeccable ground manners, trail rides happily, and loves his job. Loch is currently in training with Lauren Billys out of Holman Ranch in Carmel Valley. For more information, please contact Lauren directly. Fuerst Nino R, known as Nino in the barn, is a stunning, genuine partner. This horse is not only easy to handle, but is calm and a joy to have around the barn. 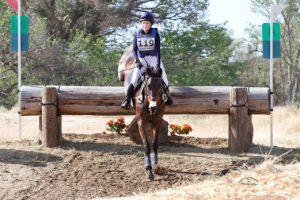 Nino has successfully competed in the sports of three-day eventing, hunter/jumpers, and dressage. 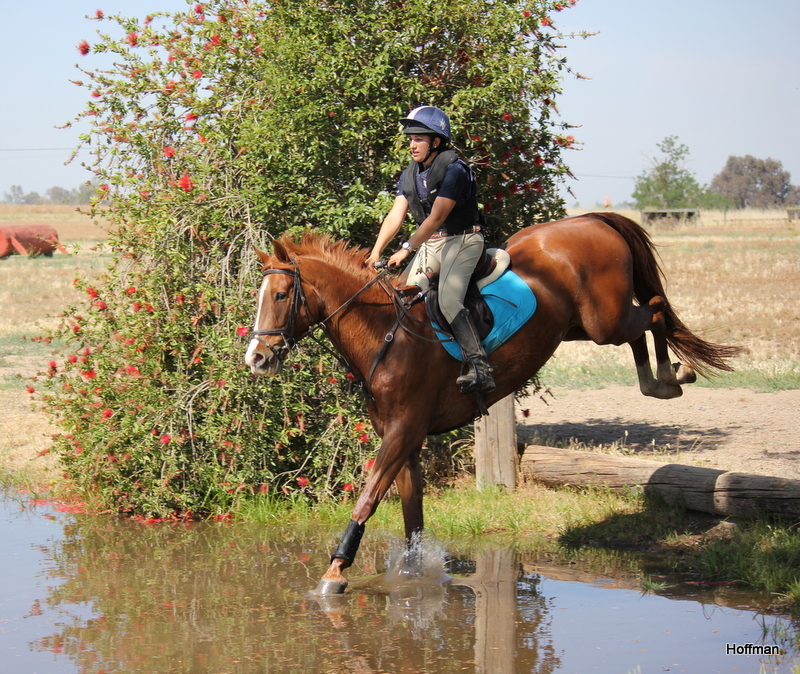 He has competed through the advanced level of eventing and is currently schooling third level dressage. Nino is a head-turner when ridden on the flat with three correct gaits and easy to get connected. He is light in the bridle and well-trained. Nino is a wonderful teacher and competitive partner. As competitive as he is in the ring, he is a sweetheart on the ground with excellent ground manners and hacks out on trails alone or in a group happily. Do More Sundance, known as Sunny in the barn, is a sweet, athletic morgan gelding. This horse is not only easy to handle, but is calm and a joy to have around the barn. Sunny has successfully competed in the sports of three-day eventing and hunter/jumpers. He has competed through the beginner novice level of eventing and had experience in the jumper ring. Sunny is straightforward and gives a light feel when ridden on the flat, with three correct gaits and easy to get connected. In the jumping, Sunny is so fun and compact; he gives a soft feel to the fences with a heart of gold, as he is capable of jumping from any distance. Sunny can be ridden out on trails alone or in a group. He is the same horse each day as he is very dependable and easy to be a round. Sunny can be ridden by a child, a learning junior or an adult amateur; his versatility is one of his traits that sets him apart. Court Jester, known as Jester in the barn, is a steady, attractive thoroughbred gelding. This horse is not only easy to handle, but is calm and a joy to have around the barn. Jester has successfully competed in the sports of three-day eventing and dressage. He has competed through the intermediate level of eventing and second level in the dressage arena. Jester has a flashy and light feel when ridden on the flat, with athletic gaits and a steady connection. In the jumping, Jester is straightforward, with a consistent rhythm and feel to the fences by jumping from any distance. He is a dependable horse in the barn. Jester can be ridden by a child, a capable junior, and a learning adult amateur; his versatility is one of his traits that sets him apart. In his training, he is schooling second and third level dressage movements and jumping courses at the height of 3’6”. This horse is a competitor in all disciplines with the ability to teach his partner the beginning stages of any sport, as well as be a fabulous companion for daily riding. My Hidden Agenda, “Remi” in the barn, is a personable and fun partner. This horse is easy to handle at the barn and has a strong connection with his rider. Remi has competed up through novice level eventing with an adult amateur and has been in professional training for the past four months. 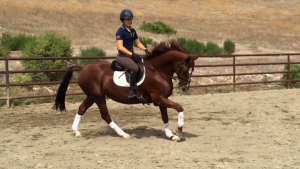 Remi is schooling second level dressage movements and is flashy and very fun to ride on the flat. When jumping, Remi has a powerful jump and is willing to jump from any distance. 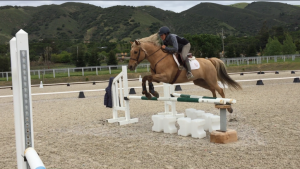 This horse has the ability to currently jump courses at 3’-3’3’’, but with more training will continue to grow. His jump has enough power and scope to show that he has a bright future. Trail riding is one of Remi’s favorite activities. He is brave and easy to ride on trails. Remi would be suitable for an adult or junior rider with some experience, wanting the right horse to train up the levels and a fun partner at the barn. Remi would be suitable as a jumping or eventing horse. Dancing Diva, known as Diva in the barn, is a flashy, athletic warmblood mare. This mare is not only a barn favorite because of her upbeat personality, but is also a wonderful horse to ride. She has successfully competed in the sports of three-day eventing and dressage, and has taught junior riders the ropes of eventing. Diva has a elegant feel when ridden on the flat, with a soft mouth and uphill connection in all three gaits. In the jumping, Diva is adjustable, easy to follow, and athletic. This horse’s record has wins from Introductory level to Training level; in 2014, she was either second or first in every event she entered. Because of this, in 2014 she was named Area VI Reserve Champion for Junior Beginner Novice. In 2013, Dancing Diva won the CDS Junior Championships at First Level with an average score of 68.9%. 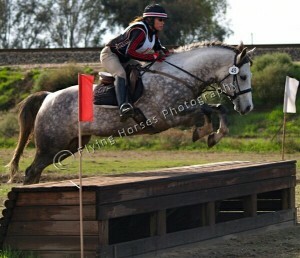 She most recently won the Open Novice division at Fresno County Horse Park on her dressage score. In her training she is schooling Second and Third Level dressage movements and jumping courses at the height of 3’3”. This horse is a true competitor in any discipline with the ability to teach her rider up the levels. She would be suitable for an adult amateur, young rider, or junior looking to be competitive in the sports of three-day eventing and/or dressage. She makes a great partner: easy-going personality, impeccable ground manners, trail rides happily, and loves her job. 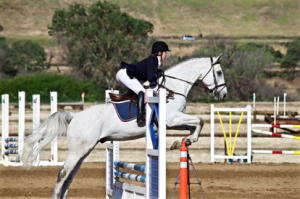 Blue is a dream horse for anyone who would like a companion to do anything from competing in three-day eventing to beach camping. Blue is a beautiful grey with a strong conformation. He has successfully competed up through the novice level of eventing in a loose ring snaffle in all three phases. 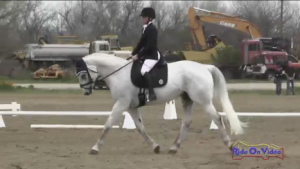 In dressage, Blue is straight-forward and a cute mover. When going cross country, Blue has a steady gallop and is unflappable when going over ditches, through water, and over gallop fences. Because of Blue’s dependable stride, he is honest with great form over fences. Blue taught a junior the ropes of eventing for the past two years. Along with teaching a junior rider, he has also been to the beach, camped in the mountains, trailers, clips, ties, and has worked with cows. He is currently in training with Lauren and schooling 3′-3’3” courses with scope for more. 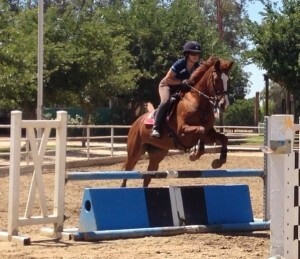 He is an all around joy to work with and would be most suitable for an adult amateur or junior rider. Monroe is an athletic mare with a bright future. She will excel in the sports of three-day eventing, dressage or show jumping. 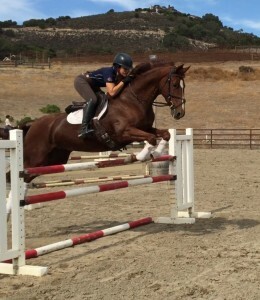 At her young age, she has shown great athleticism and confidence in the jumping and dressage schooling ring. Monroe has competed in local dressage and eventing shows, as well as schooled at cross country at Fresno County Horse Park. In her first dressage show, she won both of her classes. Currently, Monroe is jumping courses of 2″9″ after only learning to jump in November of 2012, and has ability to do much more. April is a sweet, talented mare. She is a barn favorite with scope to spare. April has successfully competed up to beginner novice eventing with the ability to compete much higher. She is talented in the dressage arena, brave out cross country, and careful in the show jumping ring. She would excel in three-day eventing (as already proven), show jumping, and dressage. She is an easy ride with a soft mouth and three rhythmic gaits. 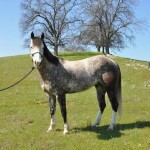 With an unlimited scope, this horse is looking for her next partner to take her to the next level. Zoose comes from noteworthy Dutch Warmblood lineage with experience in fourth level dressage and high-level show jumping. Zoose was broke at DG Bar and started under Willy Arts. He has competed in two events in the introductory classes at Ram Tap in 2010 placing first and second on his dressage score. With his attributes of trainability, a desire to please, and athletic movement, Zoose will become a strong competitor in eventing, jumping, or dressage.